Wheeled Sports - what a choice! 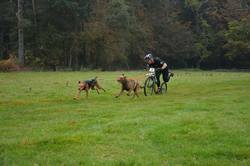 ﻿Bikejoring is simply attaching your dog to the front of your bike and letting them pull/run in front of you. 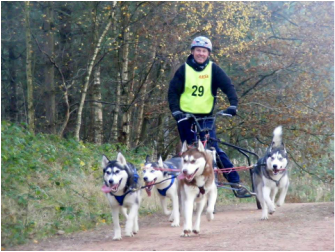 Most dog breeds are suitable for bikejoring. Its best to go off road, single track trails around woodlands are the best. 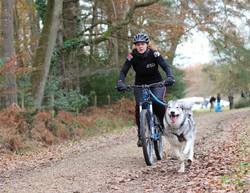 Your dog will love every minute of working with you, but having you able to help them as you pedal around. ﻿For all wheeled events you will need some specialised equipment; a good fitting harness for your dog. A bike/scooter attachment and a bungee line to go between the dog and your bike/scooter. Also a helmet, glasses and gloves for yourself!